FINALLY... IT CAN BE REVEALED! WHY IS THIS MAN SMILING? WATCH THIS SPACE! 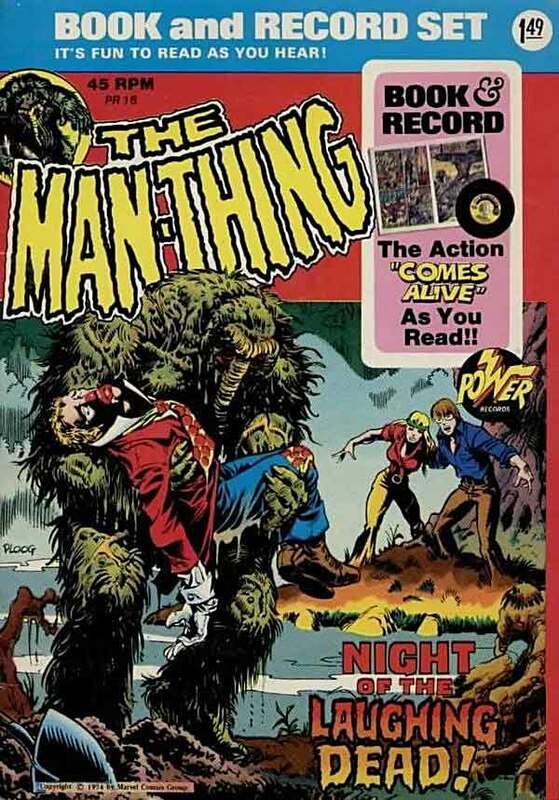 MAN-THING : "NIGHT of the LAUGHING DEAD"
written by Steve Gerber and with art by Mike Ploog and Frank Chiaramonte. Produced by Herb Davidson and Charlotte Saunders, and narrated by Peter Fernandez, this is a tale of existentialism, despair, love and death. Inner jacket with 45 RPM record in sleeve. Created with voice actors reading the comic, panel by panel, the idea was to present a comic book as a fuller experience, but, unfortunately, one that while adding the depth of sounds and effects, also removed the imagination factor from the reader, allowing them to merely read along with the audio presentation. These video presentations (with thanks to SecretCavern) have "animated" the comic book pages to be in synch with the audio. So, turn down the light, turn up the volume and try not to be afraid. 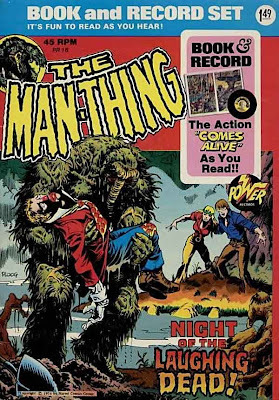 Oddly, this is but the first half of the complete tale, as it continued in Man-Thing -vol. 1- # 6, but Power Records did not produce the subsequent issue as a record set. A part of the Book and Record series by Power Records (and Peter Pan Records), this was but one of a "Monster Series" (which was a sub-category of Marvel book and record presentations). 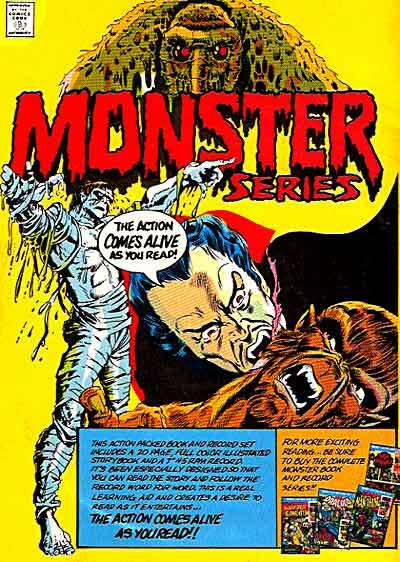 Other releases included: Tomb of Dracula, Monster of Frankenstein, and Werewolf by Night. "Trick or Treat. Smell My Feet..."
but wear your SOUL on your CHEST! It is my profound pleasure to present to you a NEW line of Apparel with YOU in mind! Art and designs by PTOR. Check out the first 2 ads (if you miss the beginning, it's OK, they are on a forever loop). Inspired by the "House of M" scene where the Scarlet Witch wishes away Mutants - what she saw as the problem in the world - our "NO MORE..." design allows for anyone to make THEIR wish for how to make the comic world better. Have a certain comic creator, character, publisher or trope that you wish would be "NO MORE..."? Make it known with this tee! Currently available in over 20 phrases (with more being added)! Choose your favorite (or LEAST favorite) comic themed annoyance(s) - OR - if you don't see your peeve on the list, drop a line or a comment here and your own specific selection can be available for purchase within 48 hours. NO MORE... "F*** YOU, IT'S MAGIC"
Also Now Available in non "no more" phrases. Re-imagined and re-drawn, this is my version of the infamous "NO MORE..." scene. Also, check out our line of SANCTUM SANCTORUM themed shirts! Currently available in 3 designs (with more surprises on the way). High Quality garments - also available in ORGANIC materials - with durable printing that won't fade or crack after washing! These are not some quick-print, low-quality "Cafepress" style shirts. It took MANY, many months of researching various printers, print shoppes and silk screen companies, brick-and-mortor as well as online, before I committed to joining forces with one whose product quality, pricing and infrastructure proved themselves to be of merit. I originally had the idea for the "NO MORE..." line when 'House of M" was released... in 2006 ! But there simply were no readily available companies that could do what I required at that time. Over the years, I would seek out newer companies, but none satisfied my every need or criteria. As I was making my research, and fairly sure that I had finally found a good company, I worked up my artwork in 2010 and I sent my designs and ordered some actual product for myself to test out in actual wearing and washing conditions before I would even think of agreeing to sell anything. I won't just slap crap together to make a buck. My moral outlook overpowers any desire for profit. Ensured of a safe, secure, reliable store site, with fair prices and excellent shipping - I am ready to open my virtual doors to the world, assured that all product will be produced with only the best quality and delivered direct to YOU! Also for YOU : GREAT PRICES! From $19.99 tees -to- $35.99 hooded sweatshirts! Something for everyone's budget, depending on your desires. And, as readers of this blog may know, since as of late I have no time to be counted on to handle multitudes of orders myself, my new partners provide an AWESOME customer service team, available to assist you with any question. And RETURNS and/or EXCHANGES available with NO HASSLES! I told you, I'm not a cash-grab kind of guy. I have always refused to put my name, time or energy behind anything that I don't believe in, and have, in my life, turned down lucrative deals because they were sleezy or just out to make a buck. So, click on either of the two animated ads (or [HERE]) and check out my apparel for sale! AVAILABLE in MANY COLOR and SIZE CHOICES! I'm not sure quite how, but after a very lean and difficult year, somehow (yesterday) I managed to make it to 3 years of producing a fair-to-middling amount of "content" (all of varying quality) for this blog! (This, on top of the prior decade or so of my merely being an omni-present commenter/ know-it-all loudmouth on others blogs, message boards and random street corners.) What I’m saying here is, obviously, I have no other life. This is my home and you are my people. Welcome! So, I thought, in the vein of anniversary episodes of various television shows, I would, once again, produce a “best of” post - thus revisiting a few of the "high-points" of this past year's blog-post entries. Disclaimer: What might constitute "High-Points" may differ from person to person. I'm sure we can ALL agree that when the average content level is a mere "meh", anything above snore-inducing is a "high-point". Who knows how to market himself? This guy! Well... seeing as how I began my blogging on a whim one October day, three years ago, any semblance of a calendar-year can be tossed right out the window. So, we will focus on what I blogged from OCTOBER 11, 2010 to OCTOBER 11, 2011. - Interested in comic-themed apparel? T-shirts? Hats? Ties? Underpants?? Well, then THIS multi-part series is for you. 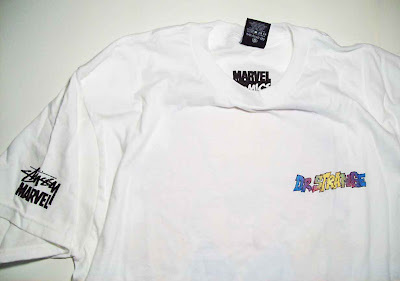 Showcasing my insane collection of comic-themed garb, with plenty of pics and histories of the items and manufacturers (and I even drop some publication knowledge in there). While this series was actually made in the previous year (2009), I have since added to it throughout the past year as well, and as such, each of the following posts have been made “new”. - On the subject of comic-themed apparel, I (less than) humbly launched my own line of shirts with these posts announcing my first wave of products with my all-original artwork and designs. - If original artwork is your lure, I presented some of my own original artwork featuring ROM; SPACEKNIGHT – which was drawn for a charity auction to raise funds for the care of the tragically incapacitated writer; Bill Mantlo! - There are also a bunch of HOLIDAY POSTS (I won’t list them all, but will showcase the best of them here)! Of course, SOME comic-blog readers actually like to read about... oh, I dunno... comics! - And, of course, we here at the Sanctum Sanctorum Comix blog also have our own "Awards Show", the "SANCTUM AWARDS". I present "Sancty's" to deserving "Best of" and Worst of" categories. Sometimes this is the only place where I may discuss certain titles, storylines or products. Other times, I am revisiting older posts with my votes. Either way, a thorough overview of the year's official product output is reviewed. I would be remiss if I didn't thank the many friends, fans, readers, followers, fellow-bloggers and wonderful souls out there who have helped, inspired, cajoled, cudgeled and commented. Thank You all! Sure, there are a lot more entries - but not all of them are merit-worthy, or while they may be good, are just silly hit-and-run style posts. Some are to showcase new products or comics that were to be released, and others are tongue-in-cheek bits of whimsy, or tips of the hat to various holidays. I have a lot like that - some quick Photoshop, an Action figure or comic scan and what passes for "wit" = a quick blog post. I'll catch you all in a few. Lots more planned for YEAR 4! for the INAUGURAL PRODUCT LAUNCH! And next, the MEGA-LAUNCH of the "NO MORE..." series! Inspired by the "House of M" scene where the Scarlet Witch wishes away Mutants, what she saw as the problem in the world, our "NO MORE..." design allows for anyone to make THEIR wish for how to make the comic world better. Choose your favorite (or LEAST favorite) comic themed annoyance(s). But THIS post is a mere follow-up. THE NEXT post is the OFFICIAL ANNOUNCEMENT and will have ALL the INFO you may wish. So go THERE to check it all out.... [HERE]. WHAT COULD THIS POSSIBLY MEAN?!?!? A LONG AWAITED EVENT IS SOON TO BE REVEALED! While I would have preferred to have posted the ACTUAL graphic and written post entry, I believe that some sort of TEASER HYPE MACHINE would also be good. So, take a look at this Flasher-Teaser (my apologies if I offend/ disgust/ shock or cause laughter) and as stated... WATCH THIS SPACE for a real announcement soon! NOTE: The real announcement will come in a day or so, but will be DATED to TODAY'S DATE (10-11-2011) so that it rests just above this current placeholder. I'll also place a link to it here, in case someone comes across this teaser at a later date. * The OFFICIAL ANNOUNCEMENT - in its entirety - can be found [HERE]. 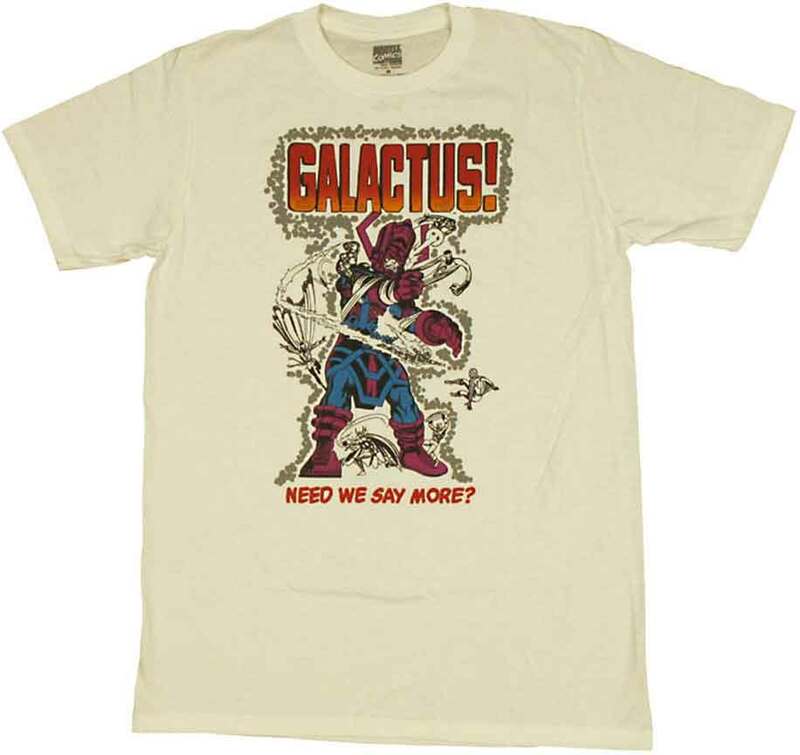 Once again, we go back to the very roots of this blog's original purpose and showcase some more swag from my Sanctum Sanctorum Comix collection. This time we are adding to a series of posts originally begun back in October of 2009, wherein I catalogued my extensive collection of Doctor Strange (and related 6-Dimensions characters) apparel! HATS! T-SHIRTS! TIES! and even SKIVVIES! (...psst... that's another term for underpants!) . Today, I have 5 all-new garments to add to this series! With the backlog of stuff I've been doing around here, these shirts have been arriving here to the Sanctum, one in every month or so, and once again, I waited until I had enough of them to showcase. Today's installment adds to several of the previous entries - and they will be added to those pages as well as being featured here. - part 2 : SOLO APPEARANCE T-SHIRTS post. 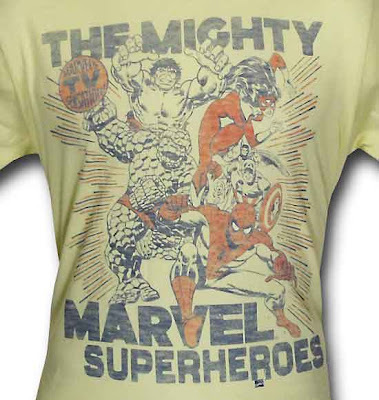 - part 3 : TEAM-UP APPEARANCE T-SHIRTS installment. - part 4 : THE "OTHERS" / "6-DIMENSIONS" T-SHIRTS installment. Let's start this off with a shirt that is something of a rare item, due to several factors - all of them mildly annoying. Printed on the inside along the bottom seam is this code that dates the garment to April 16, 2011 (a week after my birthday) - along with the Stussy logo and all designed to emulate the old Issue #/ Date / Comics Code Authority box from nearly every Marvel comic in the 1980's. Still, I'm not THAT bad with my mania (...much... anymore...) and am quite content to be MORE than satisfied with my single acquisition. ESPECIALLY, since it came to me as a gift of sorts, from my dear friend, and fellow Doctor Strange fan / collector - Howard Hallis! So, when they presented him with this shirt as a gesture of thanks (and also as his payment?) he was magnanimous enough to send it to me since he knows my Doc-garment collection is 2nd-to-none. Not to worry, friends of fairness and barter-system buddies, as I promised Howard a special garment in exchange (something that will be revealed here in a forthcoming post). Next we have some add-ons to the - part 3 : TEAM-UP APPEARANCE T-SHIRTS installment. 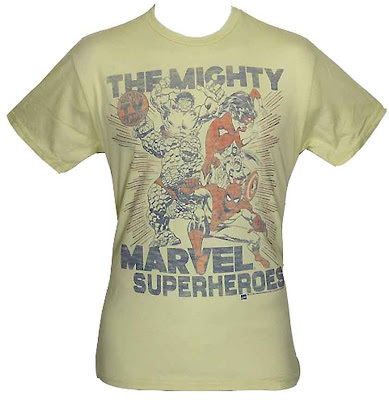 This first shirt is a 2011 release from JUNK FOOD and features "THE MIGHTY MARVEL SUPERHEROES" with a blurb that says "MARVEL'S TV SENSATION!" 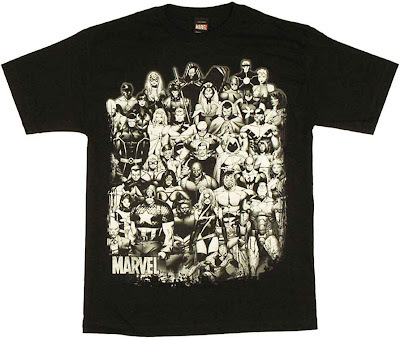 That is because this shirt features all of the various Marvel heroes who have had their own TV SHOW (or in the case of Doctor Strange... a TV MOVIE - which was really a television PILOT episode for a show that wasn't picked up by the network). Here's a close-up of the shirt graphic. 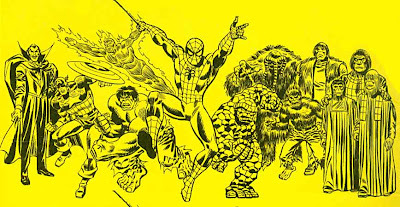 Hulk (who sported one live-action and one animated series), Spider-Woman (she had a cartoon series), The Thing (the FF have a few animated series under their belts), Doctor Strange (hugging up against Spider-Woman's hip), Captain America (a veteran of several made-for-TV movies/pilots), Invisible Woman (also of the FF shows) and of course, Spider-Man - he of live-action and animated fame. Notoriously absent are Sub-Mariner, Thor and Iron Man who had their own "animated" series' in the 1960's (although, Iron Man did also have a cartoon in the 1990's). Since I have only purchased one, and this isn't a design that I would wear around town, I have not removed mine from the packaging, and so here it is. 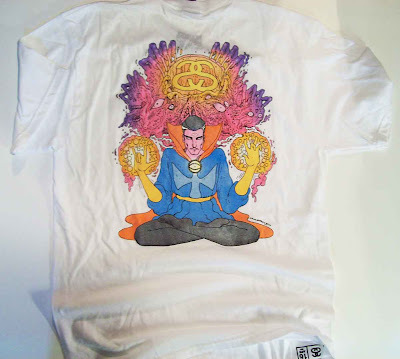 This shirt, a 2011 release from MAD ENGINE reproduces the John Byrne cover artwork from the classic Fantastic Four v1 # 243. From one of the very best issues of Fantastic Four - evah! 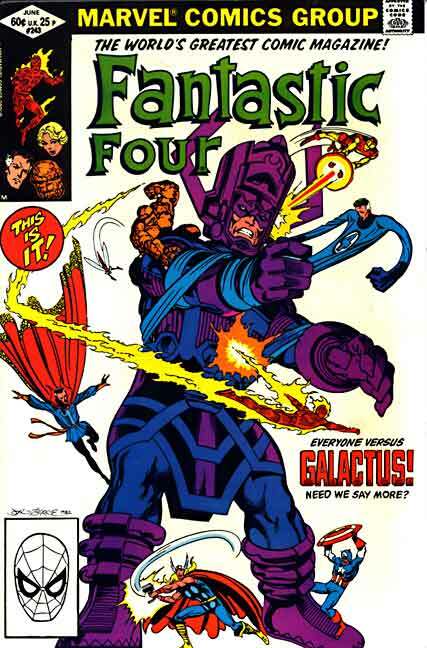 Doctor Strange joins with Avengers and Fantastic Four to battle Galactus! 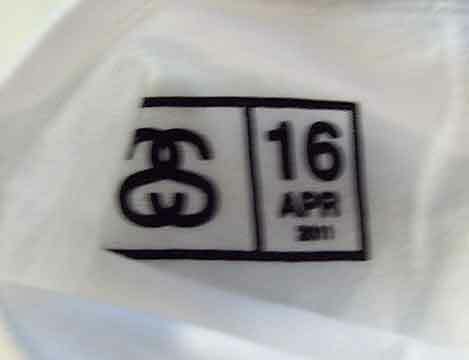 For the same reasons as the previous shirt, here is mine, still in packaging. However, I should note that there was one weird little tweak that Mad Engine did to the artwork. They added a figure of Spider-Man on the far right side. While Spidey does make a brief appearance in the comic story (with Daredevil), he does not join the fight against Galactus, nor is he actually on the cover. 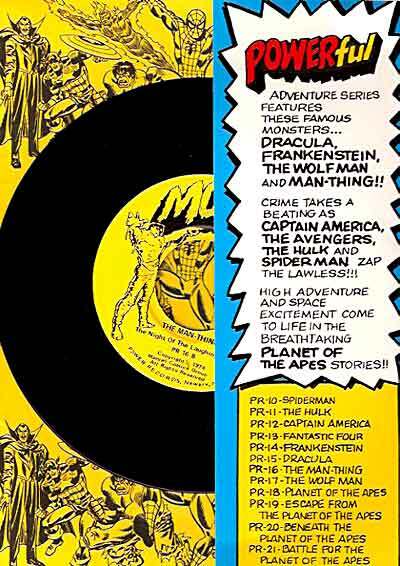 This is the original comic cover. Doctor Strange kicking out kneecaps since 1963. Story and artwork by John Byrne. 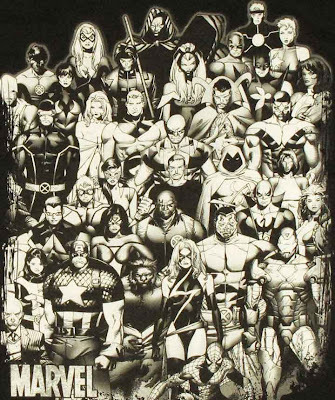 The next "Team-Up" shirt is this one - also from MAD ENGINE in 2011 - that features a veritable 'Who's Who' of Marvel's super-heroes. Allow me to present a close-up shot of the assorted members of the cape and cowl crowd. 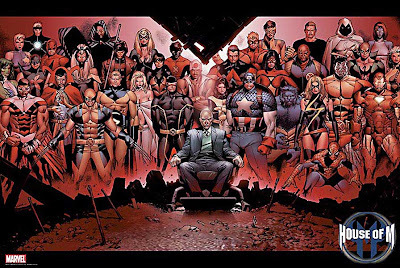 As many may immediately recall, this artwork was originally from the wrap-around cover for the first issue of (and poster for) "House of M" by Olivier Coipel. I present the color version below. Mad Engine's design crew turned the "landscape" image into a "portrait" image by simply photoshopping the right side of the image to the bottom half on the new pic. 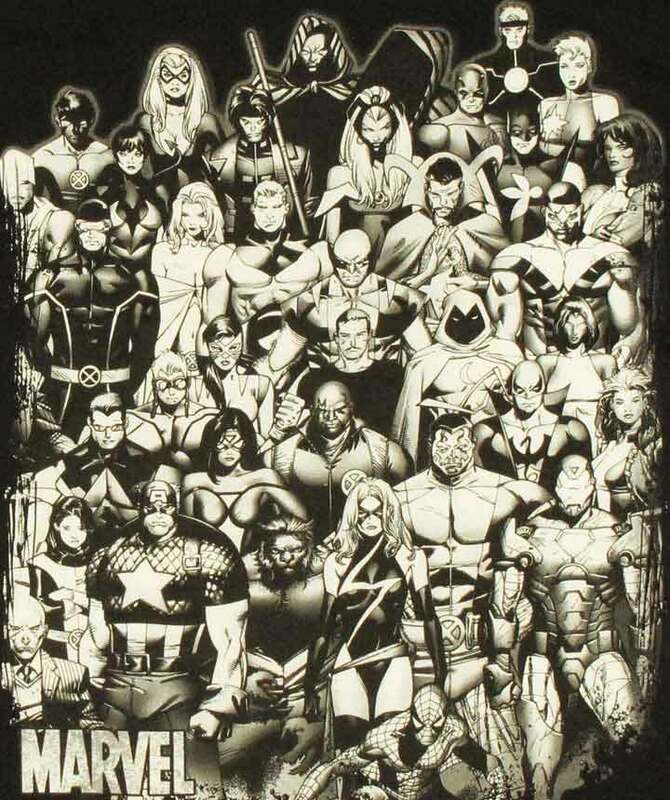 They also, for some inexplicable reason, flipped the right side of the image which caused some heroes chest emblems to be seen in reverse (see YellowJacket, Dazzler and most obviously Daredevil). A little extra work and this could have been easily fixed. Truthfully, I'm not a big fan of Mad Engine because most of their designs are slapped together like this, with not quite enough work to make them of truly professional quality. Still, since Doc is on it, I had to get one. Here's mine. Another of the limited edition exclusives by STUSSY x MARVEL, this shirt features classic Steve Ditko creation, and Doctor Strange entity - ETERNITY as redrawn by Will Sweeney. 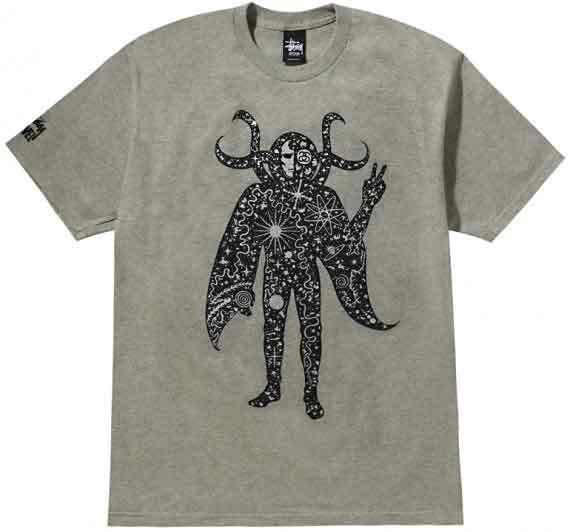 Black ink with details in SILVER on a simple, grey tee, this is perhaps one of the coolest of the Stussy shirts and one that I really, really, really want another of, so that I can WEAR it! "But, PTOR..." I hear you ask, "Why not just wear the one that you have?" Well, folks. But for two reasons, I would. You see... even if I did want to wear this one - and thus cause its inevitable wear and tear and destruction (which I won't, since it is so cool, so don't ask me) I really can't wear THIS ONE... because it is in a size MEDIUM. I could probably fit onto a medium, as I am svelte of build, with a dancer's/swimmer's body, but I typically prefer my shirts to be in a LARGE (or sometimes an XL), as I like the freedom of movement and minor drapery that a larger size provides. And so, I can only look upon my Eternity shirt entombed within its plastic sarcophagus - thus, and dream of what might be. A reply to a write-in query. I receive letters (well, emails) every so often, from people who - for one reason or other - find themselves in my little corner of the web, and, noting my dedicated (read: too-nerdy-for-my-own-good) knowledge of Doctor Strange and the mystic corners of the comic worlds, ask me for insight. I'm sorta like the guru atop a far-off mountain peak. But, it's a mountain of comics. And I wear pants. Well, I received a very well written and thought out letter from someone (let's call them "-H") new to the mystic worlds of Doctor Strange, and wanted to know a little more about him. I seem to have been bitten by the "Doc" bug, but I need to talk to someone older and wiser. I'm not and never have been a comics person, but I am something of a gamer. I got interested in Marvel vs. Capcom 3 last year because my heroine, the goddess Amaterasu, was going to be in it. Now out comes the roster for Ultimate MvC3 and... hello, who's this? Some distinguished-looking fellow with the legs of a dancer is here and the fanbase is rolling on the floor in ecstasy. Who is this turkey? I was intrigued. I started reading up on him and was smitten. But I dug too deep and now I'm just confused. There are too many Doctors Strange. (I've always thought comics folk overcomplicated things, and now I'm certain). Even if you ignore alternate-universe versions, the character himself has been around since the '60s and since then he's been in so many different stories by so many different writer-artist teams that I have no idea which IS Doctor Strange. Yes, the internet abounds with personal statistics and blueprints of his house. Yes, he uses magic and wears a red cape (most of the time). But I'm actually farther from getting any grasp on his personality than I was when I started. So tell me: Who is Doctor Strange? What does he care about? What are the consistent aspects of his character? I bought and read the trade paperback version of "The Oath" (which was excellent) and my impression is that he is a professional, still a bit arrogant, still inclined to think like a surgeon, who does NOT react well when up against his limits (and yes, he has them); typically not impressed by humanity, though they can surprise him and he seems to enjoy it when they do; slightly inclined to tunnel vision in his chosen field (assuming magic is the answer to everything when a mundane solution works); but basically good-hearted. The sort of person who would have many associates and few close friends. But is that Doctor Strange, or is that just Brian K. Vaughan's Doctor Strange? And there are major questions which I'm sure the fanbase must be asking. Where is he now? Why doesn't he go to Tibet and become the next Ancient One if he's not the Sorcerer Supreme any more? If Hulk broke every bone in his hands in World War Hulk, why do they still look more or less intact in later series? And there are all these petty questions. Why do his gloves have spots on them? Did the Ancient One ever actually heal his hands? Why isn't the Eye of Agamotto open all the time? You seem to be a geek like me, and one thing all geeks like to do is expound. If it's time for me to wade into the world of comics... well, okay -- but I need a better grasp on who this is that I'd be wading into them for. An excellent letter, am I right? Aside from the letter-writer thinking that I may be "older and wiser", I may be older, but they seem to be pretty smart and intuitive, themselves. It seems that just by their basic investigation, "-H" has more general insight into the character than many of Marvel's current writers. Now, I could follow my usual modus operandi and turn this into an overblown, highly analytical entry with tons of scans from comics and clips from other media, but... that really wouldn't be an actual help. Don’t get me wrong, I will probably bloviate at length in many of my answers, but I will try (and fail) to keep things to the point. Scans and other visual references, however, while a nice touch, aren’t truly necessary. Much of the answers to the questions that "-H" asks, are either cut-and-dried, easy-peasy replies, or - and this is the very problem that "-H" is encountering - there are too many differing variations (either due to creative team, publishing era or type of title wherein Doctor Strange may appear), thus making a definitive answer the subject of which era of which you prefer or worse yet, personal interpretation. So, I'll just go through the questions and give answers as best I can. Well, to start off, one comment that '-H" makes is that Doc has the "legs of a dancer". And that is an excellent observation. In fact, many writers make that exact descriptive parallel, often evoking his graceful movements. One of my favorite instances is by PETER DAVID, from the novel "HULK: WHAT SAVAGE BEAST"
"Into the bunker strode a new arrival. He was tall and slender, and moved with such casual grace that one would have thought that he was a dancer rather than a doctor of medicine. Indeed, he seemed to walk as if his contact with the surface of the earth was tenuous at best..."
David goes on a bit more into how Strange "glides" and how he is in all ways graceful. For the geeky among us (ie; everyone reading this), there is an excellent (and nerdy) scene where Doc meets a character from the old HULK TV show. David's description of Doctor Strange, and his general handling of the character is among the best of the current crop of Marvel writers. Even though Strange isn't the star of that book, Peter David makes Strange shine in the time he is in the story. While on the subject of Doctor Strange in other media, I would like to suggest you pick up a copy of William Rotlser’s ‘NIGHTMARE’ paperback. While not an award winning novel, it has some very endearing passages that deal with Doctor Strange as a mystic as well as a human being. Seriously, if you can find a copy, pick it up. I enjoy it so much that I give it a re-read every year or three. "Who is Doctor Strange? What does he care about? What are the consistent aspects of his character?" As much as these should be the easiest questions to answer, they sadly are not. Even more than most "founding father" characters at Marvel, Doctor Strange can be defined by the era in which he is written. The Lee/ Ditko Doctor Strange is not the Stephen Strange of ANY subsequent creative team. Think about it- honestly, if a character is handled by a single creator then these would almost be guaranteed to be well-defined and easily identifiable aspects of the aforementioned character. Sherlock Holmes is one such tried-and-true, precisely delineated creation of a (mostly) single creator. The realms of "fiction houses", however, with decades of changing creative teams, make such steadfast adaptations more difficult to maintain. This is because different creators have different "takes" on what they think makes the character work. Or, worse yet, with decades of hundreds of issues and even more stories featuring the characters, many aspects of the character (that could perhaps be definitive) are simply "lost" in the mists of time, only to resurface when or if another creator happens to recall them (or comes across these tidbits during research - which sadly, fewer and fewer writers do these days). 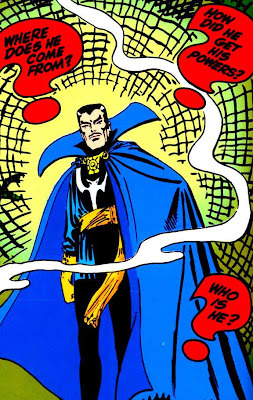 In the early 1960's Doctor Strange started as a variation of the comic book style mystic, not as corny or pat as a Mandrake (Ditko's visuals alone took care of that), but one who dealt with the same "my mentor's other student is my greatest enemy" trope that was typical of Mandrake. Another similar comic-book stand-by was that Strange, as a neophyte and very-much human mystic would often have need to defeat his more powerful foemen by wits and guile, rather than flash and outright displays of power. 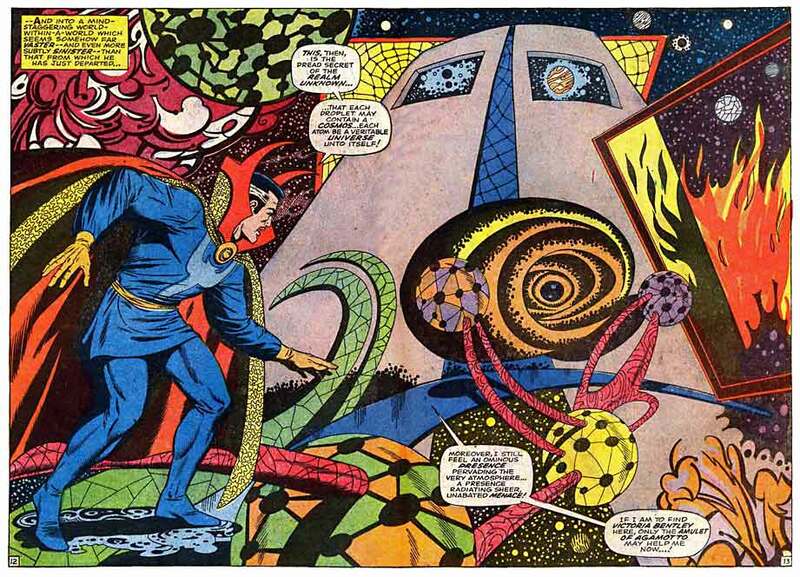 What helped Strange to excel beyond the mundane "magician" angle was the Ditko / Lee additions of such great foes as Dormammu - the despotic ruler of another dimension - and allied aspects such as Eternity - the very incarnation of all-there-is. On the subject of Eternity, by the mid 1960’s with Dr. Strange’s epic graphic novel (and it IS perhaps one of the first true graphic novels of comics) with his seeking the secret of “Eternity”, in quite possibly the best Doctor Strange tale by Ditko / Lee, he was set up as an action/ adventure hero, molded in the fashion of many 1940’s films. Alone, on the run from multiple foes, all-seeing phantom spies everywhere, Strange dressed in plain clothes on a desperate quest to find the secret to an ages old mystery with nearly no one to help him, and even old friends being turned against him by the forces of evil. The Eternity saga developed Strange’s world to actually BE a world. He had friends and enemies in many continents. Jetting around the world, either via modern air travel or mystical means, Strange was shown to be a man of the world. Experienced in many cultures and having a deeper, heretofore unknown history than most heroes of his day. The late 1960's made Strange into a more hip, darkly noir character (bless artist Gene Colan for that) and then later as a "masked superhero" which didn't last long - up until Strange's quitting as a magic-user. When he returned a few years later, the 1970's saw Strange vary between cosmic, enlightened mystic and hip, overly-protective lover/ teacher to his adept lover/ pupil/ disciple; Clea (outcast princess from the Dark Dimension and niece of Dormammu). This was also the advent of Strange becoming the all-powerful sorcerer that many know him to be. Able to do much of anything with little to no effort - save when required by the story - or deliberately "de-powered" by editorial fiat. The 1970's also saw Strange as a ringleader of sorts to a makeshift superhero team; The Defenders. In those tales, he is a father figure: wise, caring, yet above the childish antics of his teammates. Most times barely suffering their grief for the greater good of all. But less of a mystic and more of a superhero who shot bolts of light from his hands. 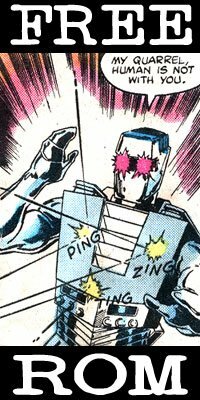 By the time the 1980's came around, Strange was far more the magic-oriented "Deus ex machina" that he would later be typecast to be. While his own title was at a sales high-point, he was oftentimes also a guest star in others' titles, where he would be called upon to save the day with a wave of his hand and a cryptic remark. Some truly great stories took place in this period, including an entire series (Strange Tales v2) wherein Strange had to relearn everything, but from a "dark magic" angle. Sadly, Strange barely survived the 1990's - as he was transformed, first, into a joking, punning super hero (Marvel trying to copy DC's then-popular title; DR. FATE), more inclined to throw a punch than at any other time in his history, and host to a household filled with scantily-clad female guests and a comedy-relief apprentice; Rintrah, all the while falling victim to each horrible cross-over event that came down the pike. He was then turned into a shaven-headed, hermit-like, power-hoarder, on the run from a villainous rival, while mentoring a faction of mystical heroes; the Midnight Sons. Soon thereafter he was de-aged, and transformed into a long-haired, beardless, young hipster (and visual rip-off of DC/Vertigo's KID ETERNITY), with a drastically different power-base and all-but eliminated supporting cast. All that, until he was finally turned into a slightly re-aged, urbane, "metro-sexual" with even another different power-source. All in all, the 1990's were a horrible time for the good Doctor. With the loss of his ongoing titles, Strange was then relegated to decades of guest-appearances and the occasional mini-series. Each one giving a tweak and a change to his overall image, abilities and modus operandi as Marvel sought a way to make Doctor Strange "workable" - or at least to find a way to wrap their own brains around a mystical hero in an otherwise all-scientific universe. But, I was asked to state his constant attributes, not his many alterations. Unfortunately, his alterations have long been an aspect that we long-time Dr. Strange fans have had to endure as we wait for a creative team to return him to a semblance of the character that we grew to admire (at whichever time-period we preferred). So it is why I had to list the periodic breakdown of character alterations. 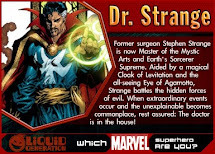 Doctor Stephen Strange WAS a former "world's greatest" surgeon (the accepted knowledge being that he was a neurosurgeon - although that aspect was only brought up years later) who was arrogant, greedy and egotistical - the classic "God complex" writ large - and lucratively. That is, until he was involved in a horrific automobile accident that caused no major, lasting harm except for nerve damage that prevented him from ever wielding a scalpel again. IRONY! In his desire to return to his former level of surgical greatness, he scoffed at offers where he could work for others as a consultant. The famous quote being; "I must be the BEST... The GREATEST!!! Or else... NOTHING!" After squandering all his wealth in the search of cures, he became a vagrant, wandering the wharfs, where he one day overheard two sailors speak of an "Ancient One" who could cure any ailment. Strange took his last efforts to journey to India/Tibet to seek out the wise man and demand a cure. We'll talk about the "cure" at the end of this letter/reply. Still, Strange's ego and arrogance are aspects that carried with him long after he learned the mystic arts, oftentimes becoming aspects of many storylines and being addressed as Stephen Strange's fatal flaw - his "hamartia". Occasionally the subject of various plots, Strange has either been forced to confront and strive to quell his ego, or inversely, be shown that his ego is what had made him great at everything he attempts and, while not a positive character trait, is indeed a vital aspect of his persona. Usually, more often than not, his flaws are played upon to keep him from being an “inhuman” or “above mere human” sorcerer. This characterization can be seen as being at cross purposes on some occasion, as a few writers have played up his second major flaw; his emotional detachment, to drive their plots. This personal disconnect has almost always been an aspect of his character, whether it is Stephen’s lack of empathic connection to the “everyman” or a deeper problem, such as his inability to truly LOVE any of his female romantic interests (see the Valentine’s Day 2009 post, wherein I list each and every one of Strange’s loves - [HERE]). Going as far back as his days as a surgeon, he was portrayed as lacking any empathy or care for his patients, beyond their paying if his fee and their ailments being dire enough that his saving them would further enhance his career and prestige. This can be seen today, in a similar way (but ignore the monetary gain and replace it with medical puzzle-solving) with the lead character in the television show HOUSE. Also similar to House, is Strange’s third flaw; his manipulation of others, and his seeming lack of regret at doing so to further his objectives. Of course, much like House, Doctor Strange isn’t about to use anyone outright in a way that would be harmful to them (at least, not intentionally – Captain Kirk also didn’t intend for so many “Red Shirted” Ensigns to get eaten by space monsters either, but these things do happen). Such manipulation of others is nearly always perpetrated in the name of “saving the world” or getting another hero to work with Strange, when they might not otherwise feel inclined to do so (similar to God’s blasting St. Paul with a lightning bolt or having Jonah get swallowed by a whale only to deposit him at the shore of the land that he did not wish to go). It is often the lot of the more “aware” (be it cosmically aware or mystically aware) “above mere human” character to be able to use his fellow man as pawns in a game which only the more powerful character can even perceive. A good writer can balance all those negative personal traits with Strange’s more aspiring and loftier attributes in a way that makes him a more fully realized human character. Two such writers are; Steve Englehart and Peter Gillis. Both of these writers have tackled Strange’s multi-faceted humanity and brought stories to bear which exalted in Strange’s dichotomy of “mystic” and “man”. Gillis’ handling of the character at the tail-end of the “Master of the Mystic Arts” series and the entirety of the “Strange Tales v2” series dealt almost exclusively with Strange’s three flaws, and used the magic and mysticism as but a canvas upon which he painted the story of human drama. But the drama was the paint. The personal angst and growth was the portrait. Stephen Strange; Hero, Mystic, and all-too-flawed human being was the subject. Englehart also handled these aspects of Strange’s character, but not in as focused a manner. Being a different era, Englehart’s 1970’s stories were allowed to have room to breathe and flow and set up Doc’s personality challenges as little vignettes of social interaction, whereas Gillis’ 1980’s works were the product of a deliberate and well-structured character arc, with a set beginning, middle and end. Still, Englehart gave us my all-time favorite scene of Doctor Strange, trying to come to grips with his touching of the infinite and his new found enlightenment to use that perception to better focus on the mundane – to see that the mundane is magical. Quick! Take a look at a post that I wrote that dealt with that scene and what Doctor Strange then meant to me and how I felt (and still feel) he best be handled – [HERE]. Like any “super hero”, Doctor Strange can be said to “care about” the safety of the world. Although, unlike most heroes, his concern does not end at the outer stratosphere of our own planet, but the cosmos itself, and even more – our dimensional plane and all of reality itself. Dr. Strange has more to worry and care about than most other heroes, even those whose forays into the realms beyond are the norm. Like a true physician, he isn’t allowed to merely see and combat the various symptoms which an ill-intended attacker might cause, nor can he focus on select affected areas of contamination. He must look at the universal “body”, the totality of reality and it is there that he is to work his medicine. Scalpels and sutures now replaced with spells and incantations. Medical journals giving way to scrolls and ancient tomes. Hippocratic oath supplanted by entreaties to the Vishanti. Aside from his mission, Strange has been forced to neglect caring about much of anything else. That is also one of the touchstones in Peter Gillis’ run of stories. Doctor Strange is on a date (with then love-interest Morganna Blessing) and his companion admits that she knows so little of him beyond his mystical persona. He laments that due to the yoke that he bears he has had no time for the trappings of everyday life. He has no knowledge or interest in the culture of “today”. He is unfamiliar with music and movies and other aspects of life that we find essential. Other writers have had Strange open his horizons and go to the cinema on occasion, or to take in a baseball game. But to this reader, those activities always feel forced upon his character, alien interactions that must be endured for an ulterior reason, rather than for their own sake. Indeed, in many instances, that is precisely the reason why is has undertaken those activities – to infiltrate a nefarious plot, but still, some writers see it as entirely possible that Strange just might want a night off. "What are the consistent aspects of his character?" As I detailed in my long-winded reply to the above two questions, there is little that is consistent to his character. One writer’s deeply-held belief is but a forgotten whim of another. 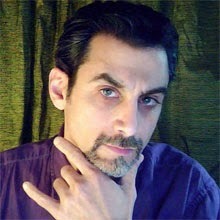 Strange has had a few perpetual aspects to his persona over the nearly 5 decades of his published history. While a mystic, even his method of magic-use has changed several times (albeit, mostly since the mid 1990’s). But that is a mere trapping, since no matter what form of magic he uses, Strange is almost consistently written with much the same methodology of action and intent (except for when, by editorial fiat or writer’s “master stroke”, Strange was being written as against type for the purpose of trying to increase sales. That, however, is a gambit that always backfires, since fans of Doctor Strange have little interest in reading him as anything BUT as Doctor Strange). Truly, that IS Doctor Strange. Brian K. Vaughan “merely” brought the character back to a point that we old-time readers can faintly remember after long years of misuse and poor characterization. One thing that Marvel seems to forget each time they try to “de-power” him, is that Strange HAS NO POWERS. He possesses KNOWLEDGE! Many times, especially early in his span as a mystic, he would battle against entities and demons far stronger and more powerful than he. He was able to prevail because he usually was able to out-think his opponents. Using brains instead of raw power. His abilities stem from his being a learned man who knows how to manipulate the eldritch forces of the dimensions and have them do his bidding, while sometimes assisted by some mystic artifacts that may possess some innate powers themselves. While, as has happened recently wherein some of the entities which Strange entreats for mystical energies may be denied him, as long as Strange has an inquiring mind and the knowledge of how magic works, he will ever be its Master. That is one of the most important constants of his character. Still, as much as I may downgrade or browbeat the “low points” of Doctor Strange’s handling over the decades, no writer has ever TOTALLY missed the mark (with the possible exception of Brian Michael Bendis, although I DO try to find redeeming points to his handling of the mystic master. I don’t succeed, but I do try). Almost every era of stories has had some bright spots. Nearly every writer has at least ONE good, true Doctor Strange tale in him or her. Unfortunately, some of those writers continue well past the point where that tale has ended and they start to stray from the true path. That hasn’t happened all that often, because more often than not, by that time, a new creative team is brought on board. 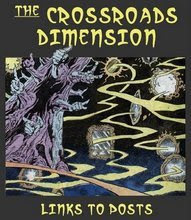 Some problems in regards to characterization fall to the fault of editorial dictum, as “events” and crossovers were imposed on the title (in the 1990’s predominantly) and Strange was used as a plot device in his own title to serve the over-arcing tale from the main “event”. As to WHERE he is now, Doctor Strange has been a NEW AVENGER for a few years now (whether officially or unofficially since his story was being told within the pages of that title well before he was actually offered AVENGERS membership). I had a series of multiple posts that I had worked on wherein I was detailing the history and future of the “Sorcerer Supreme”, in that series, I showed what Doc was up to from the point that he lost his mantle of Sorcerer Supreme. You can check that multi-part series out [HERE]. As of late, Doctor Strange has been involved in the "Fear Itself" crossover. Spinning out of the events of that Strange will find himself as one of the "MIGHTY", a group of Avengers granted weapons empowered by Asgardian magic. Built and designed by Tony (Iron Man) Stark, and blessed by Odin, All-Father to the Asgardian Gods, these weapons will help Doctor Strange and the other "MIGHTY" to defeat the villainous "Worthy" who are the wielders of Asgardian hammers much like the one belonging to Thor. Also, Doctor Strange has been involved with an impromptu assemblage of his former DEFENDERS team-mates,while battling against the various "Worthy", in the pages of "Fear Itself; The Deep", and a new DEFENDERS title will spin out of that gathering - staring in December 2011. “Why doesn't he go to Tibet and become the next Ancient One if he's not the Sorcerer Supreme any more?" There is a very good reason Strange doesn’t go to Tibet to take on the mantle of Ancient One. First of all, it’s almost guaranteed that he will eventually regain the mantle. But also, if he did , there would be no more comics starring Doctor Strange as not many people will want to read stories about an old guy sitting in a snowy retreat, contemplating the universe and his navel. The whole “Hulk broke Doc’s hands” thing really makes no sense. No long-standing Doctor Strange reader can find even an iota of “factual” evidence to support that event. First of all, Strange was in his astral form when the Hulk performed that crippling attack. It was made to seem as if Doctor Strange allowed himself to become attuned with the reality of the Hulk’s mind-scape, and as an act of friendship, made his astral form more solid to grasp Bruce Banner’s hand in friendship, only for Banner to “Hulk out” and crush Strange’s hands. I am sorry, but I call shenanigans to that. 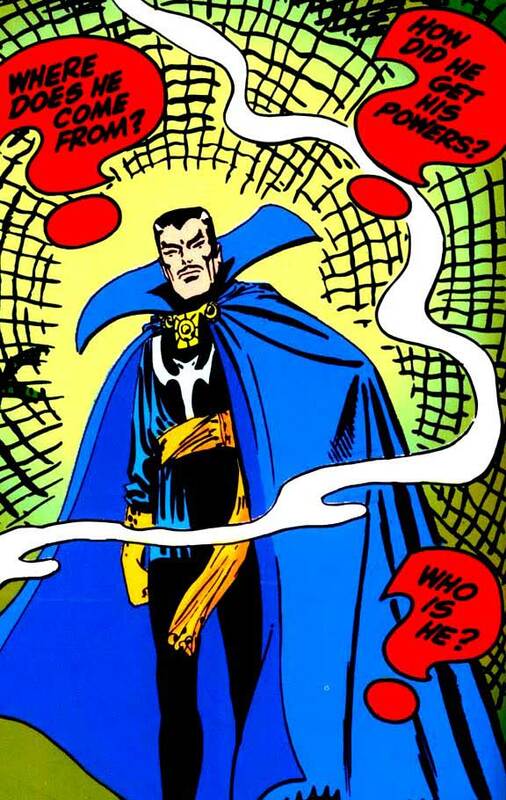 Strange has NEVER been able to make his astral form “more real” and even if he were touchable while in that state, it would not affect his physical form. A similar event happened in an old Defenders issue, when Strange’s astral form was transmuted into a demonic beast by the power of a demonic insurrection. Doc’s astral form was perverted and changed, but once it was reunited with his physical form, all was made right. So, for Doc to suffer a physical injury because his astral hands were damaged is a totally made-up, new, never-seen-in-canon type of hocus-pocus just to perform the editorially demanded neutering of Doctor Strange. However, even though that is now something that we Doc fans have to “accept” as “possible”, it seems that only Brian Bendis still writes Stephen Strange as suffering from that debilitation. All other writers just deal with the fact that Doc is no longer able to use his old spells and is using some new (or previously unused) ones. Bendis alone continually hamstrings Strange with many detrimental limitations. The reason that Doctor Strange has spots on his gloves is an easy question to answer, but the answer is probably going to be a bit of a let-down. 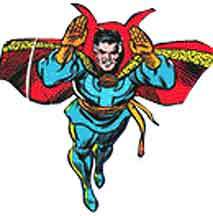 Strange’s classic costume was designed by the phenomenal Steve Ditko. 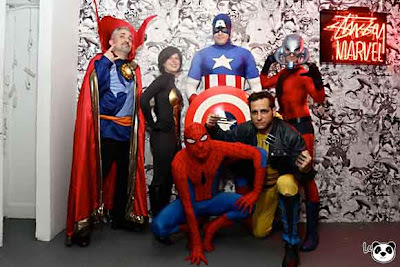 Ditko had always maintained that when designing a costume, it should be done is such a way that a reader can identify the character by ANY piece of his or her uniform. As an artist, and knowing that sometimes a character might only be seen by a single piece of their body – ie; their hand, a foot, a silhouette – and as such, every aspect of their costume should be definitive. Thus, spots on the gloves. Before I ever read that old anecdotal attribute of Ditko’s costume design, I had developed my own theory as to what the dots meant, and in the monumentally famous Doctor Strange # 55, artist Michael Golden also seemed to feel much the same way. My theory was that sort of like the iconic comic visual; “Kirby krackle”, I thought that these spots were representations of eldritch energies and that the dots would get larger or more visible when he cast strong spells and wielded more powerful energies. 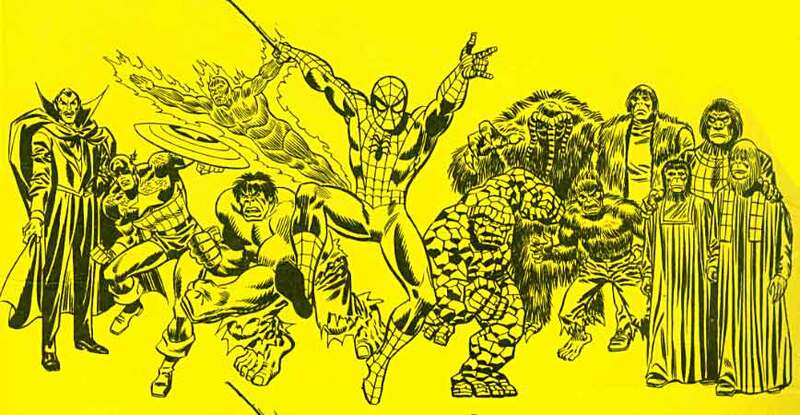 In that fan-favorite issue Michael Golden rendered the spots in just such a manner at various points in the story. However, the real reason is “unique design”. While Strange did stay on to learn the ways of mysticism and magic, his hands were never actually healed and as such, still suffer from some slight trembling on occasion – something usually held at bay with meditation and concentration. Strange's injured hands being the ironic means to end his callous life and begin a new one also set forth the tale of redemption that is at the heart of the story of Doctor Strange. He was an absolutely horrible person, but now, he is set to try to atone for those past mistakes. Whenever he feels some of his old arrogance, the tiny tremors in his hands is usually enough to center him. The trembling hands of Doctor Strange has been a factor in several stories, either as a simple reminder of humility, or at times when a surgeon is desperately needed, but no other doctor is present, or in times of great doubt and a limiting factor is required. This is why having the Hulk crush Strange’s hands in the World War Hulk story made little sense. There were already ways to play up those old wounds that already existed. Aside from the irony of the situation, such a hobbling was simply unnecessary. The Eye of Agamotto has almost always been shown to be closed until such time as it is needed, and then, with a spell it would be revealed from within the amulet so that its power can be brought to use. Aside from losing out on the “thrill factor” of having Strange call forth the Eye from its housing, to have it remain open would negate the specialness of the artifact. Certainly, while the visual of having the Eye always open and moving around, looking at things while Strange is walking around could be an eerie and delightfully mysterious effect, it wouldn’t really work as well in a static medium like comics. If, however, in a film version of a Doctor Strange adventure, to have the Eye move around on its own and have it freak out some unsuspecting “civilian”, that would make for a good visual. Even with that said, there is something even more amazing to have it come forth from the amulet and THEN move around. Imagine the startling effect of having the eyelids part to reveal the Eye, and THEN for the Eye to move around on its own. Within the milieu of the comics stories, the amulet would work like a pair of golden eyelids which open to reveal the Eye, and then once the Eye was called forth it could be used to perform any number of amazing feats; seeing into the minds of others, looking at past events, looking through solid items, casting purifying light, piercing any lie to reveal all truths, and much more. The Eye can also be called to leave the amulet and secure itself to the forehead of its wearer so that the images that it sees will go directly into the mind of he who commands it. The amulet could even be made to grow in size and open to reveal a dimensional portal. Within the pages of New Avengers, artist Leniel Yu started drawing the amulet/Eye as if it would open and close of its own volition. The color artist amplified the error by coloring every surface as the same golden color without a white outer area to the Eye. Then, the next artist, Billy Tan rendered the Eye like it was a golden medallion with a carved eye motif on the surface, instead of the proper way which was that the amulet concealed and housed the Eye, which dwelt within. These visual mistakes have been carried forth by subsequent artists of the title until the Eye’s apparent destruction at the hands of Doctor Voodoo while battling an entity that claimed to be Agamotto himself. I do hope that I actually answered “-H’s” questions and didn’t just ramble on and on without satisfying their (or your) “educational” requirements. It’s always good that newer readers (or gaming-non-readers) get interested in older characters and show eagerness to learn about the history or “true natures” of these heroes. I always feel that it behooves a new fan (or even a creator who is new to a character) to inquire of long-time fans online (at individual sites and not on a generic message board as the former tend to be bases of operation of knowledgeable sources while boards are open to anyone with an opinion – many times resulting in flame-wars that veer far askew of the subject at hand). And if anything incorrect (or at least contestable) is stated, it can be debated in the comments section. So, while Doctor Strange seems to be about to undergo a new direction with a new look and a new power structure, I can only hope that Marvel remembers the unique nature of Doctor Strange - a mystical hero amidst their scientific universe, nearly immortal and empowered by knowledge.